Our second visit to Ad Hoc was for a 9pm reservation on a Monday night with some fellow Yelpers. Monday’s are happening at Ad Hoc because every other Monday is Fried Chicken night. It’s also family night for the staff at Keller’s other restaurants, so you’ll likely be eating with many of them…even Thomas Keller himself! Could Ad Hoc take fried chicken to the next, unbelievably delicious level or was it all just hype? devil’s food with white chocolate ganache. I’m not a fan of iceberg lettuce, but the bacon lardons and cherry tomatoes were incredible and made the baby iceberg wedge salad more interesting than it should have been. I ended up making little bite-sized BLTs on my fork. The highly anticipated fried chicken was a sight to behold when the platter was placed in front of us, and I can honestly say that this is the best fried chicken I’ve ever had. The chicken is fried perfectly and every piece, even the white meat, was juicy and delicious, and the skin had a great crunch. The secret is two-fold. First, the chicken is brined to ensure that every piece stays moist. Then it’s dipped in buttermilk and dredged in breading. This produces fried chicken that retains moisture without being greasy while creating a perfect crispy crust that’s got a bit of tang from the buttermilk. The fried chicken was so good, we actually sang to it, accompanied by songs from Ad Hoc’s dinner music playlist. When will I eat you again? Is this the beginning, or is this the end? Some of The French Laundry staff that were sitting at the table next to us were amused by our enthusiasm for the fried chicken and told us later that they will always remember us whenever they hear those songs again. Our sides were minty haricot verts and garlic smashed potatoes. This combination is so simple and delicious, it’s quickly becoming our go-to side dishes at home. I was kind of dreading the cheese course of Cypress Grove Chevres Humboldt Fog with Marshall Farm Honey and Toasted Pecans. We were really full when this arrived because we had asked for a second helping of fried chicken. But amazingly, the cheese course was actually refreshing and it helped me prepare for dessert. Dessert course was a collection of cupcakes—angel’s food with dark chocolate frosting, lemon curd with lemon buttercream, devil’s food with white chocolate ganache. The lemon curd was easily the best of the bunch, with the devil’s food with white chocolate ganache coming in third. The second-best cupcake of the night came from our friend Grace, who coincidentally brought some carrot cupcakes with her to share with our party. 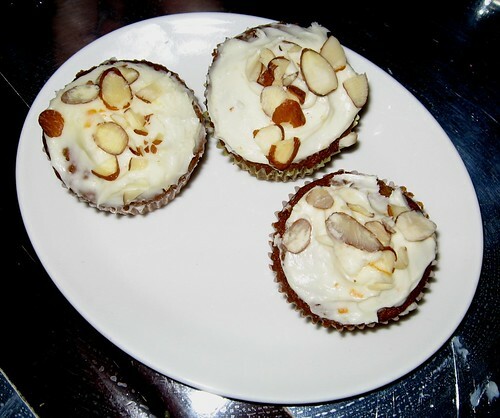 Grace’s creations featured a light, carrot cupcake with hints of ginger and orange zest topped with a cream cheese frosting and almond slivers. The accomodating staff at Ad Hoc even plated them for us and served her cupcakes next to the house cupcakes. We were trying to get them to serve one to Thomas Keller, but that didn’t happen. At least we tried!